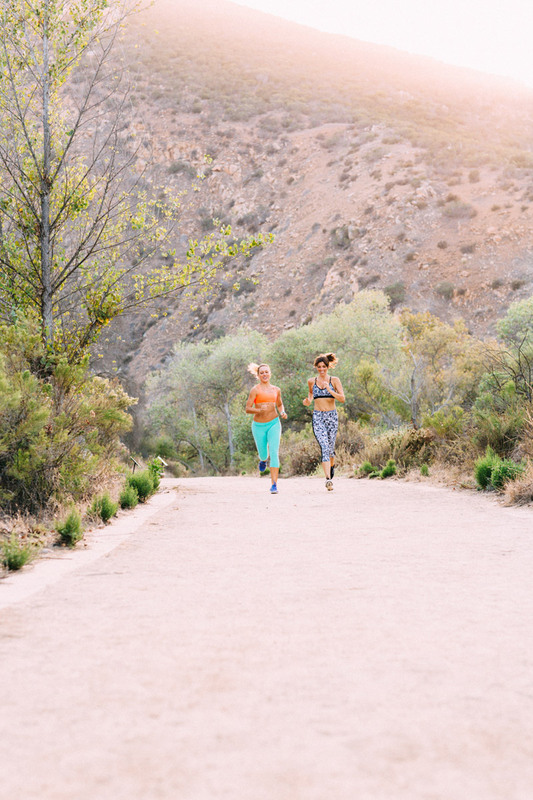 Sprints: Find a stretch of road, sidewalk, or trail about 1 short block long. Take off running, as hard as you can, and count out 20-30 strides (right and left foot landing). This is a quick burst! Being safe, of course, really push the sprint! Then jog back to your starting spot. Booty Kicks: Standing on your right leg, lean slightly forward and bend the standing knee. Extend your left leg straight out behind you, and lift as high as you can. Pulse three times at the top, with your glute fully engaged. Release to touch your toe lightly to the ground. Repeat, 12 kicks on each leg. Plie´ Star Jumps: From a wide stance, with toes turned out, bend the knees to squat low. Pulse three times at the bottom, then launch upward into a jump, reaching arms up high. Land lightly, with knees already bent to go into the next squat with three pulses. Repeat 12 times. Side bends: Stand with feet hip distance apart, slight bend to the knees, abs engaged. Reach right arm up, left arm stays at your side. Lean your whole torso up and over to the left, reaching with your right arm, sliding left hand down toward the outside of the knee, as far as you can stretch. Pulse three times at the bottom, then return to standing. Repeat 10 side bends, each side. Figure Four stretch: From standing, cross left ankle over your right thigh, as you bend the standing leg to create a little shelf. Sit as low as you need to, to feel the stretch. Hold at least 30 seconds, and repeat on other side. If the balance is too tough, hold onto a chair or use a wall for support.